While it may seem that a particular mechanical failure happened “suddenly,” the truth is that it had probably been sneaking up for a while. Here is what to look for. He was joking, of course, and most folks understand the importance of this task and take it seriously. Yet, what exactly is being checked varies considerably from vessel to vessel and skipper to skipper. An infrared pyrometer is among the most useful tools for engine room checks. Stuffing box and forward-mounted cutless bearing temperature should not exceed 30°F above ambient water temperature. 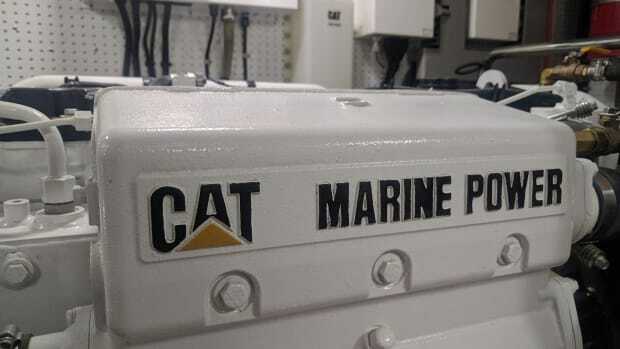 When I evaluate a vessel, I carry out a pre-start-up inspection of the engine room, following a routine I’ve established over the course of many years and many hours in engine rooms. Routines are important aboard your vessel because they establish regularity, and regularity thwarts the tendency to forget or overlook items, some of which can be critical. There are two goals in this process, the first one is obvious: Look for and expose problems or potential problems. Beginning at that location I walk, look, touch and sniff my way around the space in a counterclockwise rotation, using my senses to identify anything that might be loose, chafing, overheating, leaking or otherwise out of the ordinary. The second goal is less obvious: Aboard your own vessel, doing this over and over again will establish an intimacy with this space, virtually guaranteeing that anything that changes will capture your attention, which, once again, drives home the need to establish and follow a routine. While not an exhaustive list, specific areas to check include: All fluid levels, crankcase oil, transmission fluid, coolant for all engines (check the recovery bottle every time and under the pressure cap at least monthly) and hydraulic fluid. 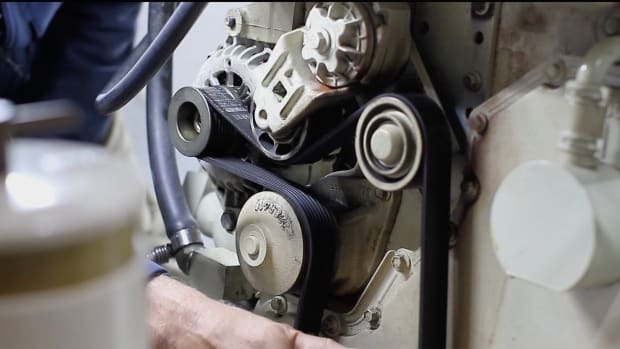 Belt tension and signs of misalignment and slippage (misaligned belts generate fine dust, while slipping belts overheat, which causes them to become brittle, cracked and shiny on the surface that touches the pulley). Transmission and throttle cable linkages (look for loose parts or wear on pivot pins and eye terminals, retaining clips should be safety wired). Those carrying out engine room checks, both underway and at rest, must be ever vigilant for loose fasteners. Fixed fire suppression system charge, pressure switch wiring and manual cable engagement (loose switch wiring can lead to an unplanned engine shut down or failure to start—make sure the service pin is removed, enabling the extinguisher to be manually discharged). Place your fingers on every one of the shaft coupling and motor mount fasteners, all should be tight. Look for signs of fretting, fine brown dust that is generated when ferrous metal parts move against each other. Check the security of the exhaust system looking for signs of leaks, salt and soot, and loose hardware, especially support struts. 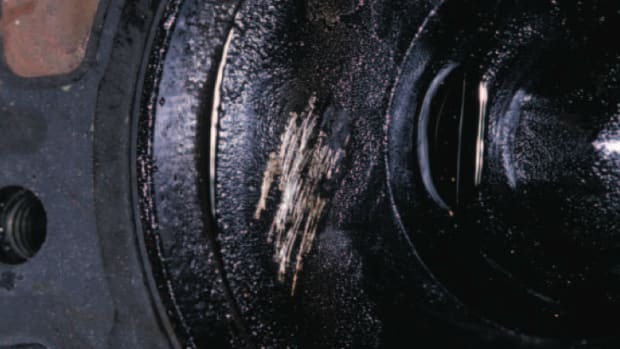 Look for signs of coolant and seawater leaks on engine hoses and expansion tanks—seawater and coolant leave behind distinct residue even when dry or “cooked” by engine heat. 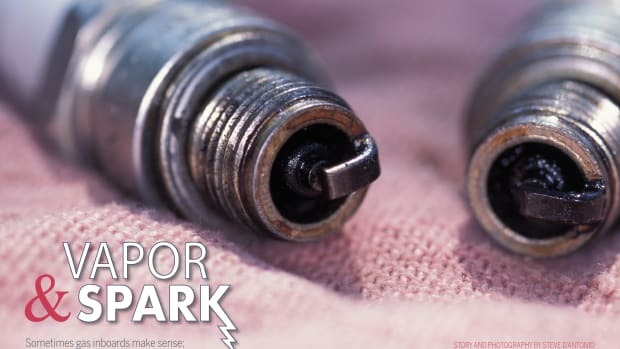 Mark the location of the coolant in each recovery bottle; it should rise above this mark when the engine is hot and return to it after the engine has cooled off. If coolant returns to a level lower than the mark, there’s likely a leak somewhere in the system. 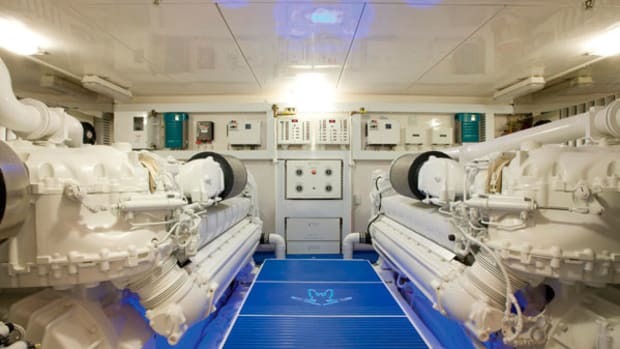 Working in an engine room while a vessel is under way presents inherent risks that must be taken seriously. Ideally, belts and pulleys should reside behind or under guards. While this is de rigueur for new engines, many older models provide no such protection. Move through this space carefully and deliberately, don’t rush. As someone who spends a great deal of time in engine rooms, I routinely remind myself to move carefully. A few years ago while conducting an engine room check in stocking feet, I slid on a slick gelcoat deck. My foot grazed the rotating shaft coupling, which was equipped with a set screw and seizing wire, the bitter end of which yanked a few threads out of my sock. It was a close call and a stark reminder that rotating machinery and limbs don’t mix. 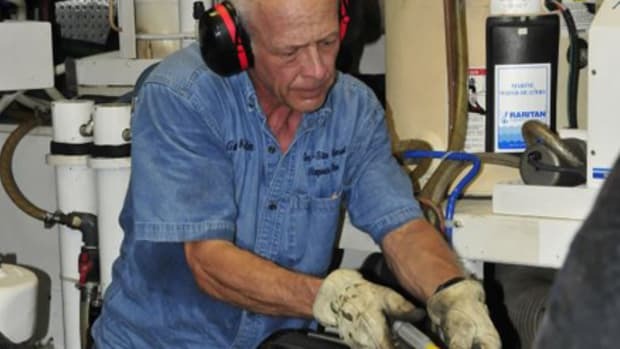 While on the subject of personal safety, when entering an engine room, ear and eye protection is a prerequisite; avoid wearing loose clothing, drawstrings or hooded sweatshirts. 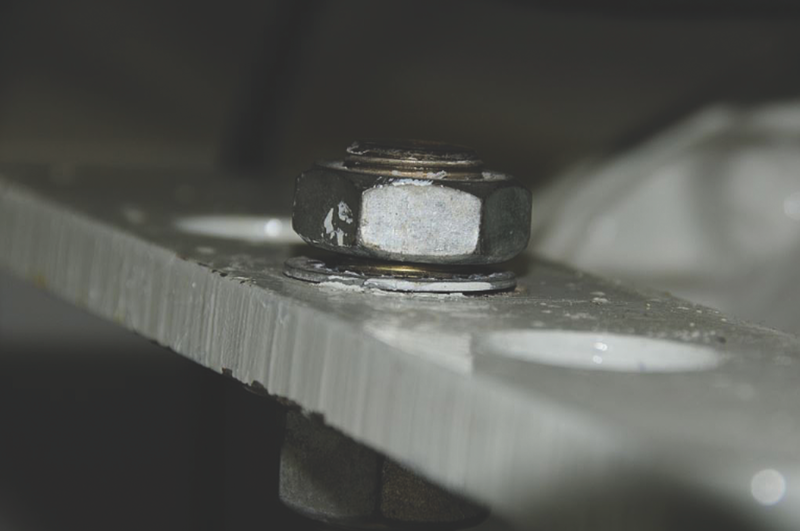 Excessive, rapid accumulation of belt dust is often an indication of misalignment of a component or automatic tensioner. Fuel vacuum gauges should be installed at every primary fuel filter. If they are the recording variety and they should be, note and reset the position of the drag needle before getting under way. During the underway check, review this gauge once again—anything above 5 inches Hg is cause for concern, anything over 10 inches Hg calls for filter element replacement, or switching to a clean filter, as soon as possible. If your air filter is equipped with a vacuum gauge, be sure to have a look at it as well. Your most effective tools for these checks remain the ones you were born with: sight, smell, touch and hearing. Leaking fuel and coolant, particularly if they are leaking onto a hot surface, have a distinctive smell. Even if the source isn’t immediately obvious, don’t ignore these clues. 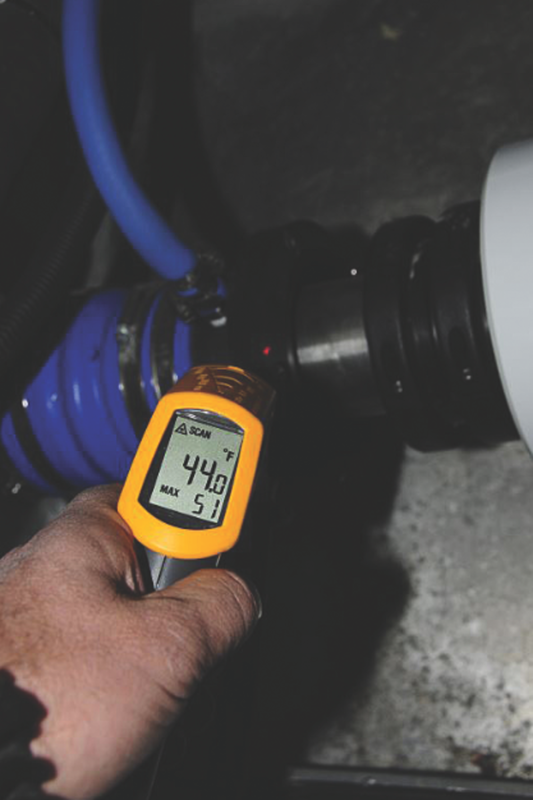 Your next most effective tool is an infrared pyrometer. The checklist for areas where it can be used is a long one; however, a brief list follows below. As good as IR pyrometers are, they are not foolproof, and their results can be skewed by highly reflective surfaces like chrome or polished stainless steel. This can be overcome by placing black adhesive tape over the location to be measured. Because a pyrometer’s typical sensing footprint is cone-shaped, its accuracy is diminished as the distance to the object being measured increases. Therefore, no more than a few inches should separate the gun from the surface whose temperature it’s measuring. Make note of typical temperatures so you can later identify anomalies and trends. Alternator: Wave the IR pyrometer around the alternator case while holding the trigger, use the highest reading. 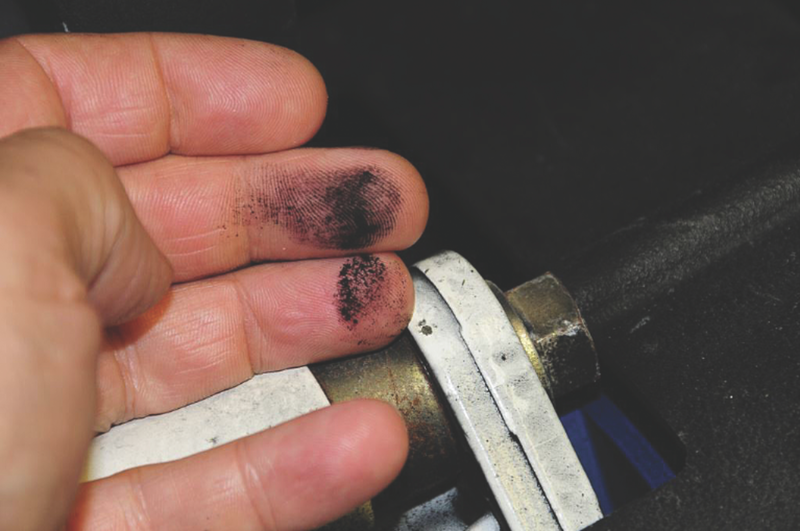 Exhaust, dry and wet: No part of the exhaust system that can be touched should exceed 200°F. Ideally, the wet portion, the parts that rely on hose and fiberglass pipe, shouldn’t exceed 160°F. Use the same scanning technique as you would with the alternator, looking for the highest temperature. Stuffing box: For both conventional and dripless, scan the stuffing box as well as the cutless bearing if one is installed in the shaft log just aft of the stuffing box. The temperature shouldn’t exceed 30°F above the temperature through which the vessel is moving. Oil pan: Measure temperature at the vertical halfway mark on the side of the pan; ideal oil temperature is between 180°F and 220°F. Thrust bearing, if equipped: Each manufacturer has its own protocol for maximum allowable temperature. Generally, anything over 165°F is an indication of a problem. Finally, engine room checks aren’t very useful if they aren’t carried out regularly. While you can’t check this space too often, doing so once every hour or two makes it likely that you’ll identify problems before they become critical.